This is Jelly's blawg: People-powered brands. One last thought I'll share before I get to it, something that's seemed to resonate recently in a couple of meetings, something at the heart of my work, maybe at the heart of a lot of the changes happening in our business and the world. Loyal blawgists might recognize the roots in my presentation from last year's Portland Creative Conference. I've called them 21st-century brands, post-consumer brands, but now I'm calling them people-powered brands. What do they have in common? People-powered brands/stories are not manufactured by an ad agency or Corporate Mktg./Communications. Their success is not connected to a collosal media spend. The storytelling of people-powered brands happens primarily through experience. People-powered brands are aligned, storytelling with action, but also with the bigger story happening in the world. By being aligned with deeper human truths, people-powered brands allow us to experience our full humanity. They expand us in one way or another. Finally, people-powered brands are open, to be lived, created, shaped, shared and interpreted by the people. Is this the future of all brands? What is the role of an ad agency in the era of people-powered brands? Discuss. I agree with your observation that these people-powered brands happen through experience and participation. It creates that sense of ownership for the user/participant/consumer and the authentic experience every ad agency is after. It seems almost de rigueur for a brand to now have a blog or some participatory component which is becoming quite transparent as faux authentication and also a bit desperate. Do any of these attempts really work? My observations are they don’t really– or they seem hollow – but what is an agency to do at this point? I think they are going to find it harder and harder to break through and I wonder if their role of creation will give way to maintenance. Anyway, where I sort of part ways with you is the idea that these brands align us to deeper human truths and allow us to experience our full humanity. Wow! Can you explain what you mean exactly? If it is that these brands are solid – ownership is felt – and they allow people to move beyond traditional consumer behaviors and values which in turn gives us more time to experience our full humanity then I am with you. But deeper human truths? How so? Is it the reflection of ourselves from these brands what you are talking about? If that is the case then I would argue the expansion is wide but not deep. Hey Deana - No, I don't think it's about people-powered brands creating an identity or reflection of ourselves. It's about them allowing us to experience and express aspects of our highest nature - primarily, our desire to express ourselves and create and connect. In contrast to traditional 1950+ consumer brands that were about badges, and shallowness, and conformity, and separation. The underlying pattern or story I see is one of growth and expansion, a move from separation to wholeness, from control to openness, exclusion to inclusion, fear to joy, obfuscation to transparency and honesty - and the brands/stories that are aligned with these patterns seem to me to be rising. Passionate preference such as love at sight." I do agree the patterns do are rising. Instinctive to be sure. The people-powered brands you identify are certainly egalitarian and that seems to be about something we’re craving. If not a reflection then perhaps a projection of what and where we want to be. 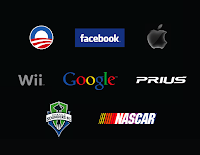 I agree that these brands (and I’m not really sure that is an accurate word because aren’t they more fluid?) are not about creating an identity for one to wrap themselves in. Their commonality seems to be about feeling not consumption – an allowance for self-expression. It is kind of like charisma – they have it. People Powered Brands should be an exciting thing for an agency. Seems these brands are built on the power of a single revolutionary "what if?" Ideally, agency culture creates the perfect storm for thoughts that lead to People Powered Brands. We're ambitious, smart, and rebellious. We're at the forefront of emerging technologies. And we're in the job of seeking out deeper truths. Imagine an agency where people are encouraged to look for opportunities in unknown brands -What's up Anomaly- Or an agency that actively pursues the next PPB and helps them develop their brand from the get go. Or, an agency that actually creates the next PPB completely in-house. This an ad agencies time to completely redefine how we talk to people. We should be stoked! We have a clean slate of ideas! It's wide open. I think it comes down to an agency being optimistic, or pessimistic about these new kinds of brands. If an agency is pessimistic, they're scared of the unknown. And they'll die. If they're optimistic then they'll see an opportunity to revolutionize the way brands communicate. And they'll see my resume. Either that, or I completely whiffed on this one. So, coming more from the field of sustainability than of advertising, but with a passion for good experience and an appreciation of good aesthetics and good wit, what I *like* about the shift to thinking of expressing brand through "experience" design is that, somewhere, down the line, years from now, *maybe*, it will provide a loophole-out of the "how does "advertising" solve the riddle that we must always continue to drive consumption in a linear economic model?" One possibility, is to shift as quickly as possibly from product-ownership models to service-delivery models, (ZIP CAR to the tenth) and in that scenario the *experience* needs to delightful, aesthetic...etc. (I love flying Virgin Airlines for this reason, their brand is definitely communicated through that experience. And, yes, it's a type of love. :) So then, I like thinking about how can 'experience design' foster more sustainable behavior based on our best human traits? Anyways, a bit oversimplified for full debate, but I wanted to contribute. im sorry mate but the Seattle Sounders are one of the most fabricated/ contrived sports teams of our era. im a student currently studying Bachelor of Communication Design, in little NEW ZEALAND-I findn your work awesome stuff. Anyway, im doing my final 4th year university paper on brand, dishonesty, and consumerism.after reading LOOKING CLOSER FOUR: i started to feel abit better...I stumbled upon -saving advertising-jelly helm.i love what you wrote and i think its so inspiring...i wanna to ask if i could use the text in a magazine that im designing for my end of year project together with my thesis.it will not be published-its just a mock up.i just want some decent text in the mag..please let me know what you think.